The danger of falling ice is high on Ama Dablam, yet still the accident was unpredicted and has taken us all by surprise. Climbing fast at 3am before light reduces the risk of falling ice. In the darkness, the climbers didn’t see or hear the moving ice. This post was meant to highlight our successes of the past few months on Cho Oyu and Mera. However, a recent event has forever marred our happiness in the death of Dendi Sherpa. Early morning on November 3rd, Dendi was guiding a strong Swiss team of three on their summit bid on Ama Dablam. They started from Camp 2 at midnight and had passed Camp 3 by 3am. Shortly after this time, the team was hit by falling ice. Dendi was in front and sadly he was hit directly. A rescue was conducted at the earliest opportunity to evacuate the surviving Swiss climbers. Hans Rudolf climbing behind Dendi sustained injuries to his pelvis and he’s currently recovering in Kathmandu. The other two Swiss climbers, Catherine Martinson and Thomas Martinson, were generally unharmed and are relocated in Kathmandu. The danger of falling ice is high on Ama Dablam, yet still the accident was unpredicted and has taken us all by surprise. Climbing fast at 3am before light reduces the risk of falling ice. In the darkness, the climbers didn’t see or hear the moving ice. Just the day prior under windier conditions, 18 climbers summited the mountain so climbing conditions were reasonable. However, we can’t over analyse the accident. We can only accept that accidents do happen, but it pains us that this time our brother and friend beared the brunt. 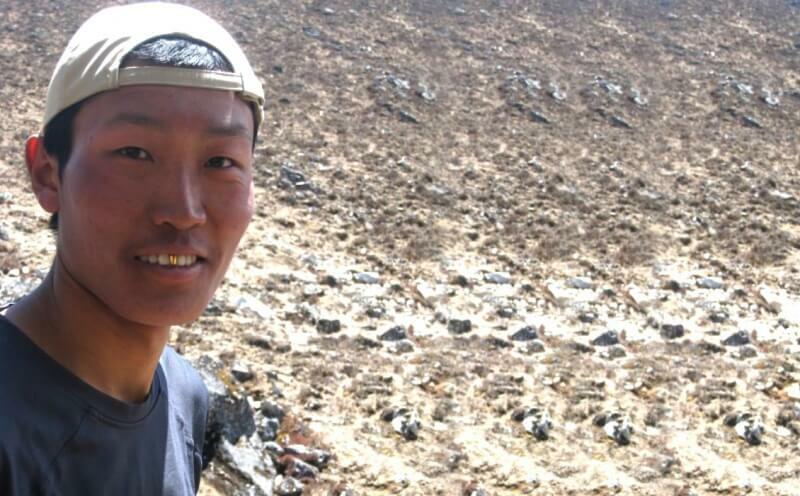 Dendi Sherpa was 29 years old from the Jubing village close to Lukla. Fondly known as “long man” due to his unusual height, he had a characteristic shy gold glinted smile. Dendi was a strong climber, a good guide and was a core member of Himalayan Ascent. His ascents included Everest, Cho Oyu , and Ama Dablam. In recent years, Dendi was looking to improve himself beyond climbing and was taking adult education classes off season to finish his high school qualification. He wanted to provide more for his surviving family of wife and 4 young children (3 sons and 1 daughter between ages 1.5 and 8 years).